An expert solution for converting multiple IBM Lotus Notes database file format NSF to MBOX format. 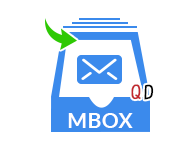 This .mbox is compatible with many email clients including Thunderbird, Apple Mail, Eudora etc. Use this tool to export Lotus Notes email to Thunderbird file format. 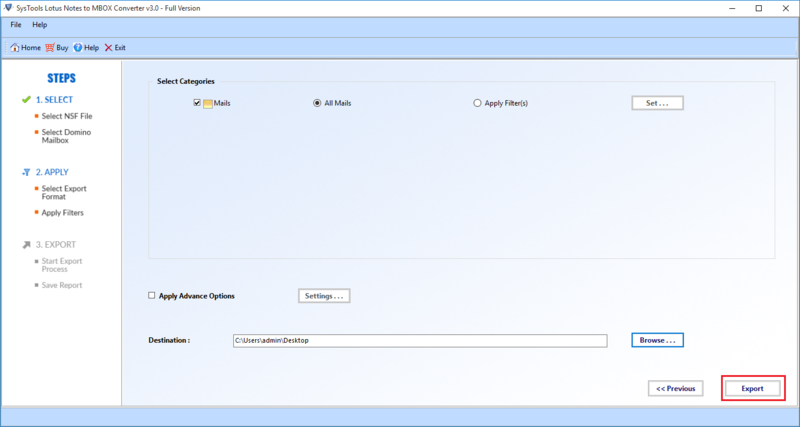 Export data from IBM Domino Server mailboxes to MBOX file. Use the NSF to MBOX Converter to migrate data from multiple Lotus Notes database file to MBOX format. 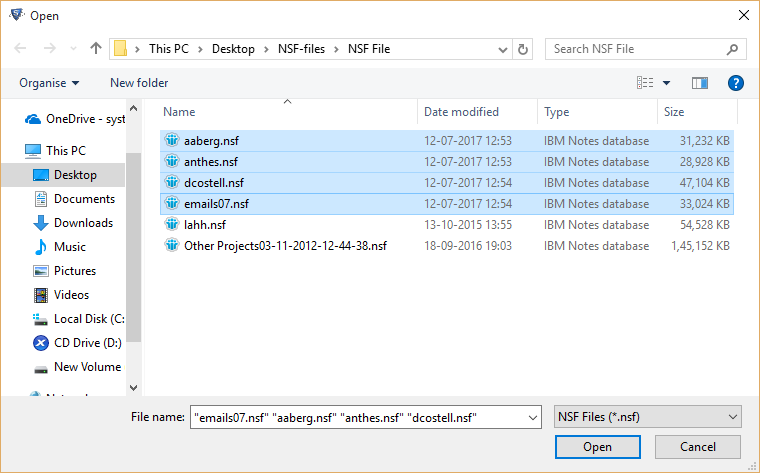 Import a single .nsf file into the tool by using the Add File(s) option. This option can also be used to upload multiple NSF files one at a time. Use the Add Folder option to upload multiple .nsf files into the tool. . Complete Domino Server mailbox emails and email folders can be migrated to .mbox file using the tool. All emails with attachments are moved to MBOX format without any data loss. Connectivity between Lotus Notes and Domino Server is essential to perform this migration. IP address and password to server accounts are also needed. Perform folder to folder mapping between .nsf and .mbox files. Customize email folders by mapping them across the two file formats. 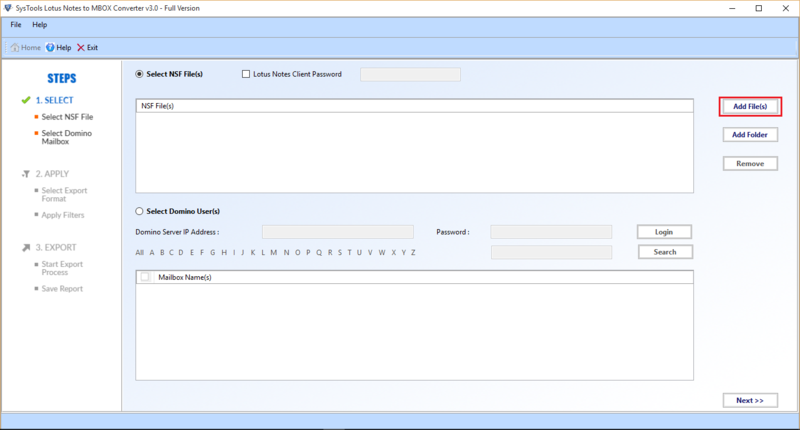 The NSF MBOX Converter to customises emails further by removing any password protection from them before migration. Detect and replace the canonical sender name to SMTP format using advanced options of the tool. There is a provision in the tool to apply a date based filter to emails to perform a selective migration. A date range can be set for the received date on emails to simplify conversion. This way a lot of time can be saved and prevent any needless conversion of data. The tool is compatible with all versions of Lotus Notes 9.0.1 and below. There is an option in the Lotus Notes MBOX Export tool to forego any folder hierarchy. This can save time during migration of multiple mailboxes. By default all the email properties and folder structure are retained by the tool. Email properties like header information and email formatting are maintained by the tool. Also, doc links and attachments are preserved during transfer. A live migration report is shown to the user during the time of the transfer. This report contains details regarding the export process. The information includes current folder being transferred, folder count, email count and the path where the migrated file is saved. These give a general idea of the migration process and its progress. Lotus Notes is email client developed by IBM for sending and receiving emails. It stores the mailbox data in a database file called Notes Storage Facility. It saves all the emails with attachments in this NSF file. Domino Server is a mail server used for IBM Notes accounts. It is used to store mailbox data remotely. Lotus Notes is commonly used as a communication and business collaboration software by enterprises. MBOX is a file format used by many email clients. It is used to store multiple emails in a single .mbox file. It is data storage file supported by Thunderbird, Mac Mail, Eudora, Spice Bird, Opera Mail, Netscape, Entourage etc. MBOX format is very popular and is compatible with many email clients. The .mbox file can be taken across platforms in Windows, Mac or Linux systems. Lotus Notes maintenance is costly for home users. Training and knowledge are needed to work with IBM emailing client. A lot of efforts are needed to manage emails in the highly secure IBM Notes client. For these reasons, it has become evident that emails need to be moved from Lotus Notes database to a MBOX file. The NSF to MBOX Converter is a safe and secure way to transfer mailbox data within an NSF file to a .mbox file. It is an innovative solution that can move data within multiple .nsf files to separate .mbox files. It is compatible with all versions of Windows 10 and below. Free trial version of the software converts first 25 data items from each folder from Notes to Outlook. Step 1: Download, Install and Start the application. Step 2: Click on "Add File" to select input file. Step 3: Click on Open button after selecting the required files. Step 4: You can select categories and browse for the destination. Then, Click on Export. Step 5: You will receive notification regarding the working of the software. Is the tool compatible with Mac Operating System? No, the tool can only function with Windows operating system. It is compatible with all versions of Windows 10 and below. Is the MBOX email client needed to perform the migration? No, an email client that supports .mbox files in not needed to perform the conversion between IBM Notes to MBOX format. Could you let me know the file size limitation on the NSF file that I upload into the tool? There is no limitation on the NSF file size that can be uploaded into the tool. Import as many files of any size to migrate from Lotus Notes to MBOX format. What are the prerequisites to moving data from Domino Server accounts to a MBOX file? Lotus Notes client must be installed on the system where the migration is taking place. This Notes application must be connected to Domino Server environment to proceed with the conversion. Server IP address and password are also needed to perform the transition of mailbox data. I am totally amazed by the NSF MBOX Converter. It is a great tool for on-technical users like me. I had no clue on how to convert NSF file to MBOX format. Luckily, I came across this tool while searching for solutions online. I was hesitant at first but once I started using it, I simply could not believe the results. Thank you! I have been using my workplace Lotus Notes account for years. I have been meaning to move some of my conversations to my personal account but could not find a better solution. Manual solutions had me confused from the get go. I tried the free version of this software and completely liked it. I have bought the premium version for rest of my emails.